If you haven't noticed... I like sparkle. It actually came as a surprise to me- I mean, I never thought of myself as one of those 'girlie-girls' (that's who I thought liked a lot of bling). Apparently she was here all along and I didn't know. After we'd made friends with each other, there was no stopping the sparkle! 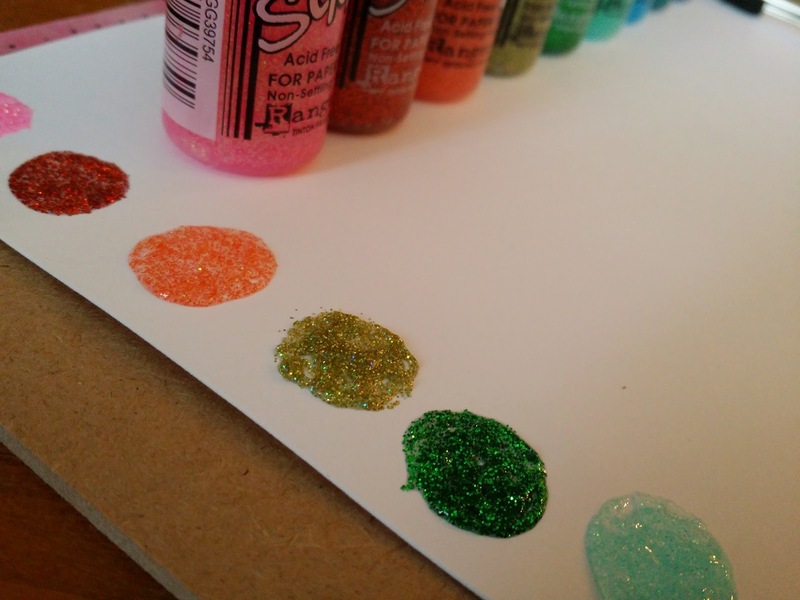 I buy every bottle of glittery glue I can find- I'm not brand specific. 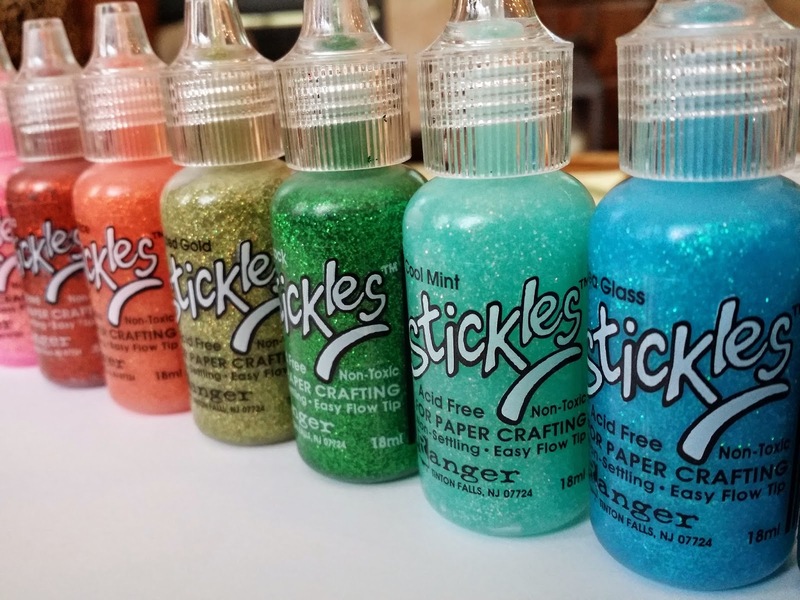 Stickles is great, but so is the Studio G brand you can find in the dollar bins at Michael's or Joann's. 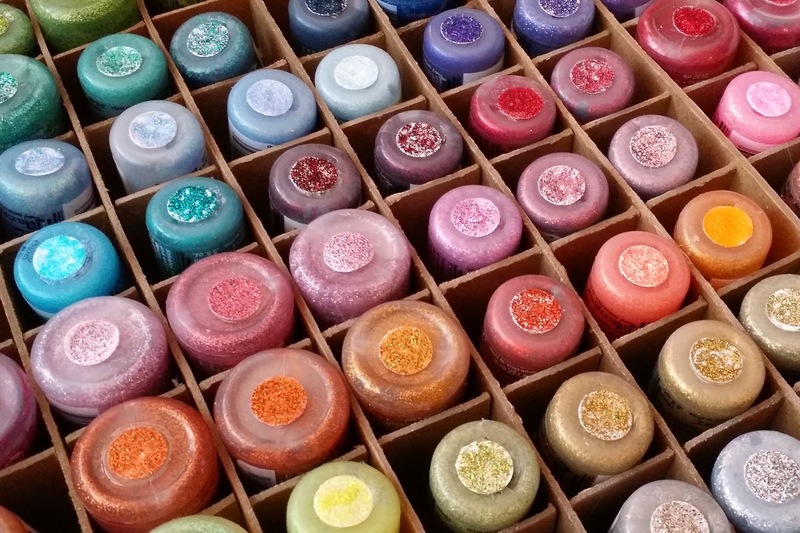 The tubes that Martha sells are nice too (really great if you need a portable source of bling to keep in your traveling scrap bag). So just how do you contain all this wonderful-ness? (I swear it's a word- look it up!) It certainly needs some type of organization or it'll drive you mad. 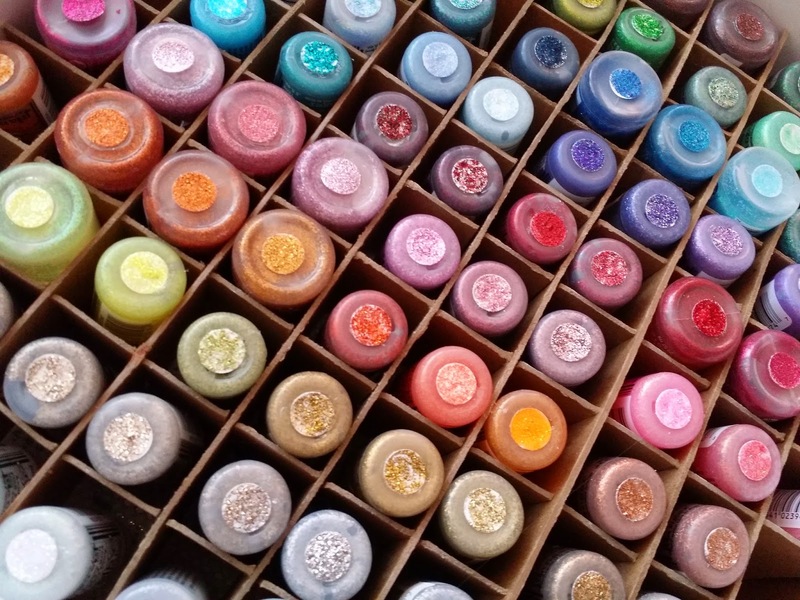 When I get a new bottle or two- or ten- home from the store I squeeze a small circle onto some cardstock. 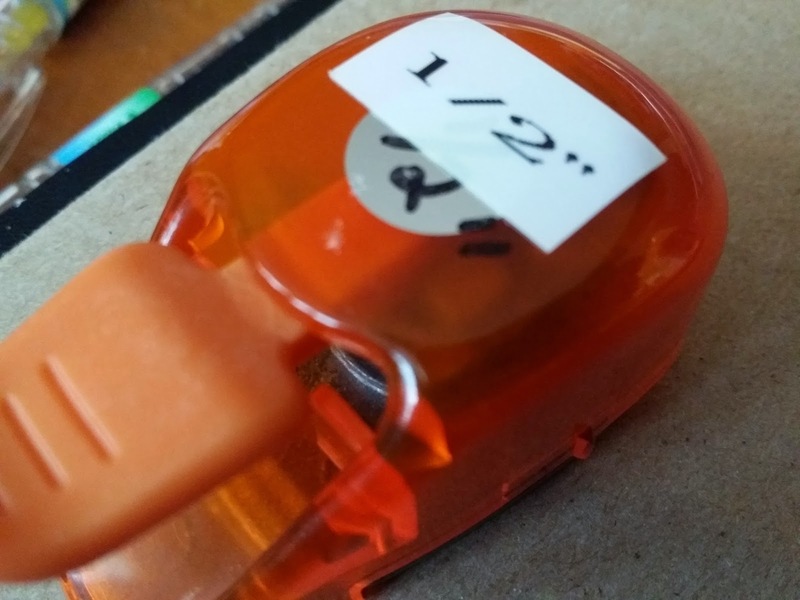 Once it dries, I take a 1/2-inch circle punch and use it to punch out a sample that gets glued onto the bottom of the bottle. Yep, you read that right- the bottom. Next you need a way to keep all those bottles corralled upright. I've got all mine stored in a drawer. 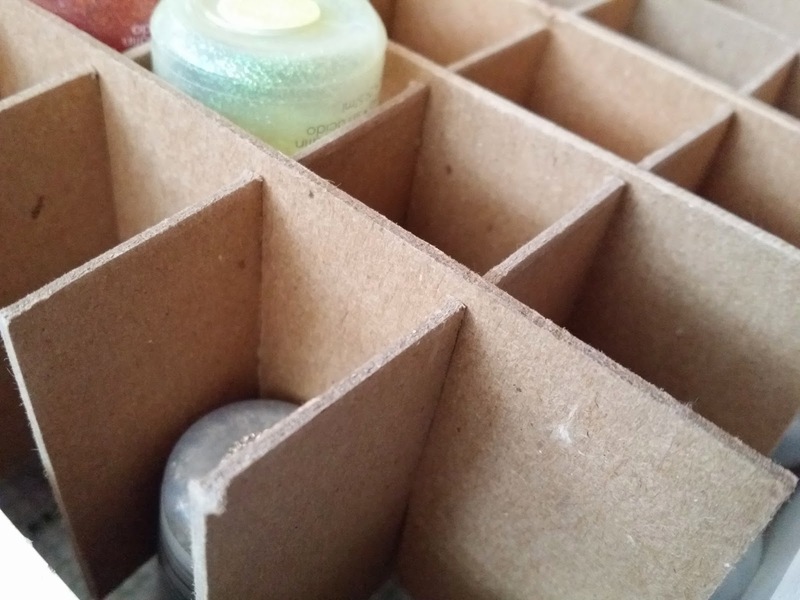 Using chipboard, I cut long strips to run both the length and width of my drawer. Using heavy duty scissors I cut a "notch" halfway up the strip, spacing my cuts about an inch and a half apart. This allows the strips to nestle against each other forming a grid. It works great! Since all my bottles have a color sample on the bottom for me to see I can easily grab the one I want. All this color makes me happy every time I pull that drawer open.